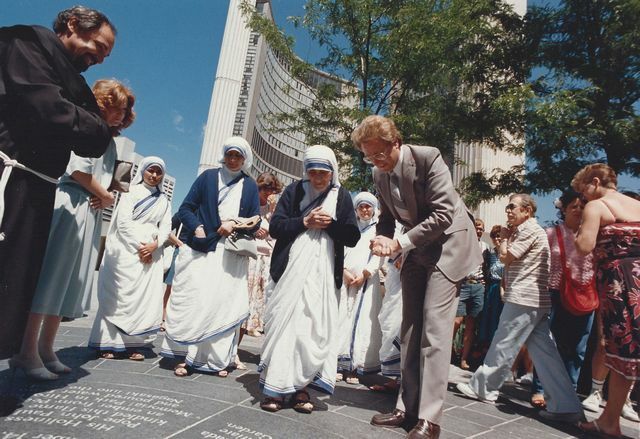 In 1983 Father Massey Lombardi, Director of the Office of Social Action in the Catholic Archdiocese of Toronto, approached Mayor Art Eggleton with the vision that the City of Toronto build a peace memorial similar to the Peace Memorial in Hiroshima that was blessed by Pope John Paul II in 1981. He also asked Setsuko Thurlow, a survivor of the atomic bombing of Hiroshima and the co-chair of Hiroshima Nagasaki Relived, a Toronto based citizens’ group for disarmament education, for assistance with the project. 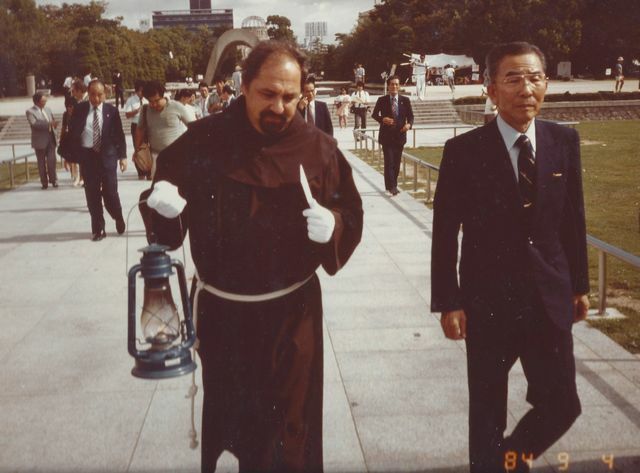 In the fall of 1983, Thurlow travelled to Hiroshima to meet with Mayor Takeshi Araki, informed him of the Toronto project, and requested his cooperation. Deeply impressed by the vision and scope of the project, and with his hope to develop with the citizens of Toronto solidarity based on a common aspiration for the abolition of nuclear weapons, Mayor Araki promised his efforts to seek the support of the Hiroshima city council. 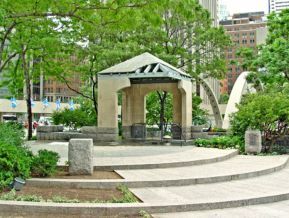 The Peace Garden represents the desire of the people of Toronto for peace among the nations and people of the world. The structure in the garden symbolizes shelter and community, and with its incomplete roof, the vulnerability of our efforts to achieve peace. The eternal flame for Hiroshima is our hope; the water represents our faith in the renewal of life. 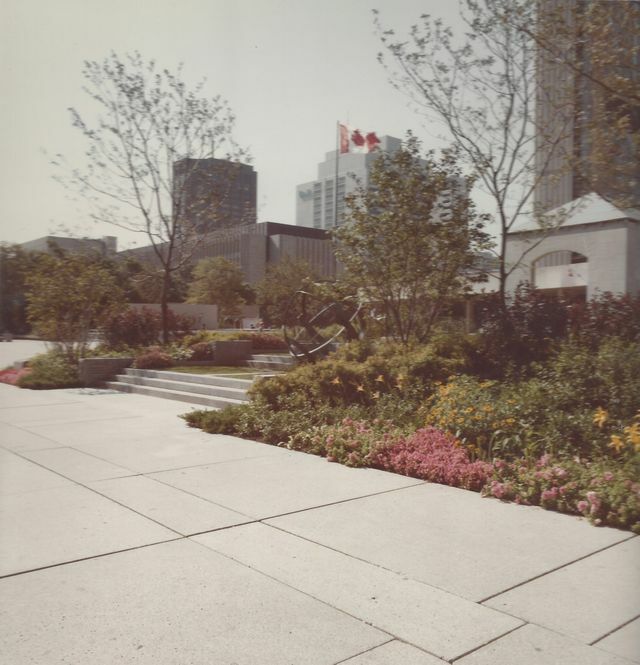 The original Peace Garden measured 1800 square feet (or 600 square metres). It cost $540,000 to build in 1984. 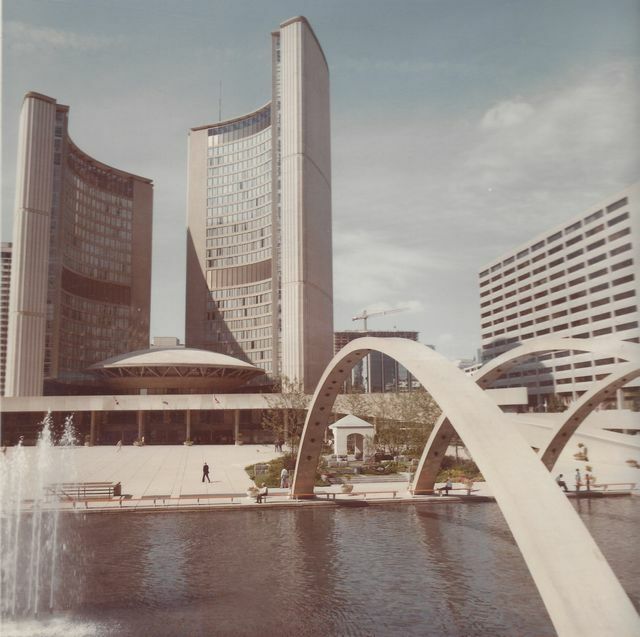 Toronto City Council approves the building of the Peace Garden on Nathan Phillips Square to commemorate the City’s 150th anniversary. 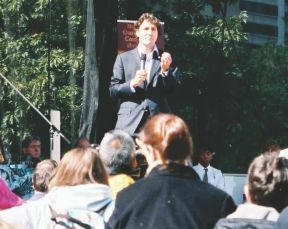 Former Prime Minister Pierre Elliot Trudeau turned the first sod during Toronto’s Sesquicentennial — the City’s 150th Anniversary. 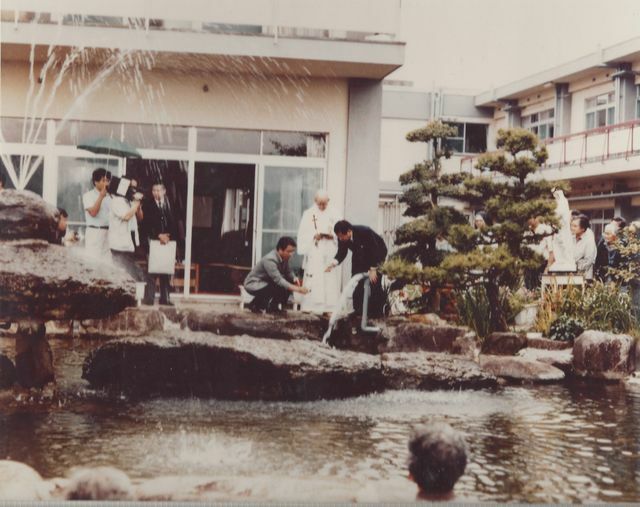 His Holiness Pope John Paul II, lit the eternal flame with an ember from the Memorial for Peace in Hiroshima, Japan and poured a vial of water from the river that flows through Nagasaki into the Peace Garden’s pool. Her Majesty, Queen Elizabeth II, formally dedicated the Toronto Peace Garden as a lasting expression of Toronto’s and its citizens’ commitment towards peace. 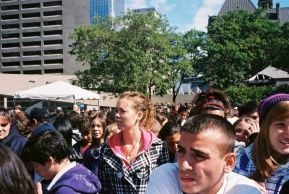 The City of Toronto celebrates the “25th Anniversary of the Toronto Peace Garden” with over 6,000 students from across the city in attendance at Nathan Phillips Square. 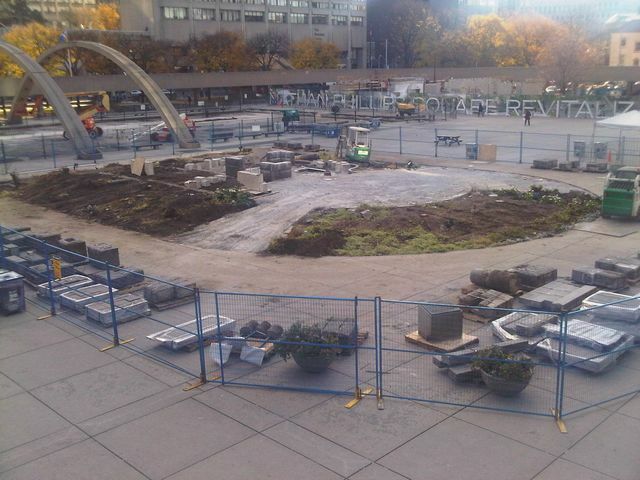 On August 7th, 2010 the Peace Garden was decommissioned and moved from its previous location in front of the doors of Toronto City Hall to the west side of Nathan Phillips Square during the massive revitalization of the entire square. 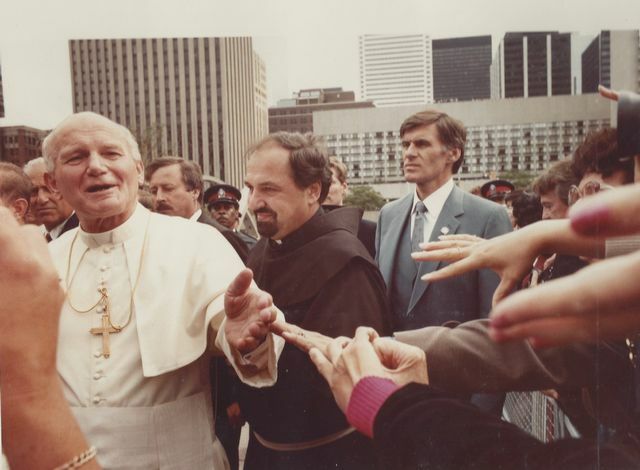 See this page for photos of the Toronto Peace Garden's new location and the rededication ceremony. Photos (left): Toronto Mayor for Peace David Miller and Justin Trudeau sign 36-foot Peace Day Canada Banner just minutes before the 25th Anniversary of the Toronto Peace Garden. (right): Setsuko Thurlow, Hiroshima atomic bombing survivor, Father Massey Lombardi, and students during the Peace Garden celebrations on September 29/2009. 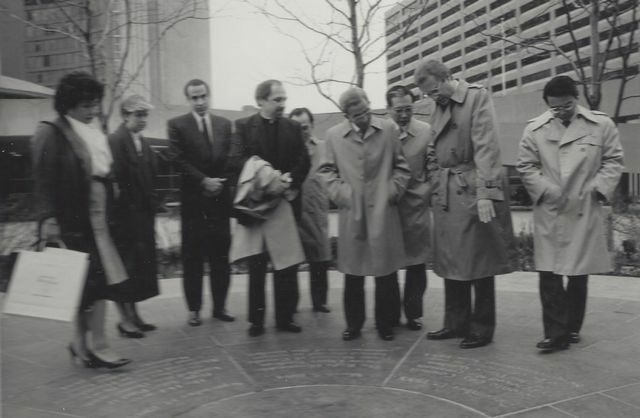 Thurlow & Lombardi were instrumental in helping to establish the Toronto Peace Garden in 1984.